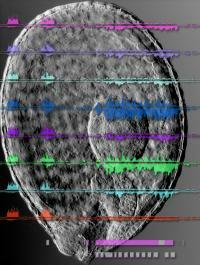 The image shows a growth-arrested embryo from a mutant Arabidopsis plant that contains a genetic lesion in a gene encoding an essential part of the exosome. The embryo is overlaid on a genome browser image of tiling expression data from an intergenic region that exhibits strong upregulation of a cluster of novel tandem repeat-associated, exosome-regulated transcripts. Cells keep a close watch over the transcriptome – the totality of all parts of the genome that are expressed in any given cell at any given time. Researchers at the Salk Institute for Biological Studies and the University of Missouri-Kansas City teamed up to peel back another layer of transcriptional regulation and gain new insight into how genomes work. Page took 0.015860 seconds to load.